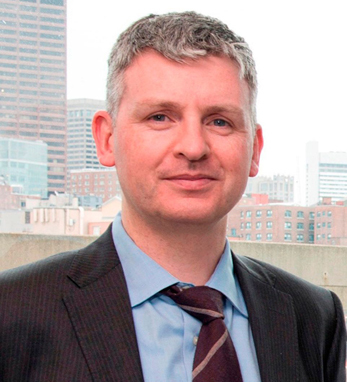 Dr. Tom Neilan is an assistant professor of medicine at Harvard Medical School, the director of the cardio-oncology program at Massachusetts General Hospital, the co-director of the cardiac MR PET CT program, and the associate director of the training program in cardiovascular imaging. His research focuses on improving the cardiovascular care of patients with cancer and HIV as well as the use of novel imaging approaches to better characterize cardiovascular disease. Tom has been named the de Gunzburg Family Endowed Scholar in Cardiology, received the Locke Award for excellence in medical education and is a senior fellow in the Oliver Wendell Holmes Society at Harvard Medical School. Born and raised in Ardfert, County Kerry, Tom is one of four children. He spent his early years helping his parents run a dairy farm and Neilan’s Bar. He completed his medical training and M.D. at University College Dublin Medical School, and his training in internal medicine and cardiology at the Mater Hospital in Dublin and at Mass General. He also completed advanced training in echocardiography at Mass General, a cardiac MRI fellowship at Brigham and Women’s Hospital, and a Master of Public Health at the Harvard School of Public Health. Tom and his wife Anne are parents to three children, Eamon, Elizabeth and Grace.